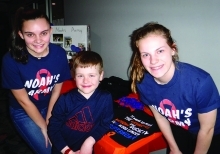 MIDDLETON–The local fundraising campaign called “Noah’s Army,” has raised tens of thousands of dollars for the Leukemia and Lymphoma Society, through the Student of the Year program. The money is slated to fund treatment research for the diseases. Emily Sanger, mother of six-year-old Noah who was diagnosed a year ago with acute lymphoblastic leukemia, knows the importance of fundraising. “Today” was the final fundraising event, a Bowl-a-thon held March 9 at Middleton Sport Bowl. MIDDLETON–After canceling meetings for public comment on a draft environmental impact statement (EIS) for the proposed Cardinal Hickory Creek transmission line (CHC), the U.S. Department of Agriculture, Rural Utilities Service (RUS) has now rescheduled the Middleton meeting for March 20. The meetings were slated for January, but due to the partial, Federal government shutdown, RUS expanded the public input period to April 1 and moved the January meeting to March. In November 2018, the Wisconsin Public Service board held meetings to gather input for the draft. Citizens shared historical site locations, Native American sites and concerns about the impact to their property at that time. Maps and documents detailing the project were also available. MIDDLETON–At 7:49 a.m., Dane County deputies responded to a school bus crash in the town of Middleton. The bus, from the Middleton Cross Plains School District, was traveling westbound on Blackhawk Rd. near Rose Ct., when it crossed the centerline and went off the road into a residential yard. The bus was in route to Glacier Creek Middle School. No one was injured as a result of the crash. Another bus responded to the scene and transported the students to school. The bus driver was taken to a local hospital to be evaluated. The crash remains under investigation by the Dane County Sheriff’s Office. 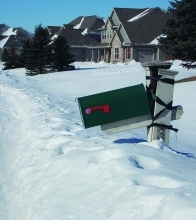 MIDDLETON–The town of Middleton is taking heat from homeowners with expensive mailboxes over its policy of paying a maximum of $50 to replace mailboxes damaged by snow plows. So far this year, the town has paid eight claims and has about 18 under consideration, Town Administrator Greg DiMiceli said at Monday’s town board meeting. 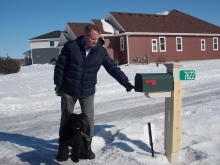 The problem some residents have pointed out, is that the covenants of their home owner’s associations require mailboxes be made out of materials costing more than $50. “Driver error shouldn’t be covered by the policy. It (the mailbox) should be replaced due to negligence,” he said. MIDDLETON–The Middleton-Cross Plains Area School District announced the two finalists in the search for a new superintendent to replace George Mavroulis who announced earlier this year that he would retire June 30. School board president Bob Green said at the board’s regular meeting on Feb. 25 that the recruiting firm BWP and Associates, contracted to assist the district in the hiring process, received more than 30 applications. BWP and Associates narrowed the pool of applicants down to a dozen which were each interviewed. Six finalists were selected out of that group and presented to the school board, Green explained. The board conducted interviews of the six are narrowed the decision down to two. Dr. Dave Gundlach and Dr. Dana Monogue are the two finalists for the Middleton-Cross Plains Area School District superintendent position, district spokesperson Perry Hibner announced Feb. 26. After a year’s absence, the celebration of acres of the giant bright, blooming flowers returns to Pope Farm Conservancy this August as a town of Middleton sponsored event, managed by a local bicycling racing event firm. The town board approved a plan by Race Day Events that for the first time charges a $3 admission, children 10 and under free, and $5 for parking or a shuttle bus ride. “We’re here to solve the problems you had the last time. We’ll deal with parking, logistics and the crowd,” Ryan Griessmeyer, Race Day Events president, told the board Monday night. Sunflower Days is set for a 10-day between Aug. 16-25. New this year is 5K Trail Run scheduled Aug. 22 that starts and finishes in nearby Pioneer Park. An extra fee will be charged for the run. LA CROSSE–The Middleton High School Girls Snowboard team came in first place at the Wisconsin Interscholastic Alpine Racing Association (WIARA) for the third year in a row on Feb. 16 at La Crosse. The 117 points the team accrued was enough for the win, with three girls placing in the top 10, including Emelie Gehrke who led the team in sixth place. Sophomores Ella O’Orazio and Eden Larsen came in seventh and 10th, respectively. “At state, we had fast racers race even faster at state than they did during some conference races. 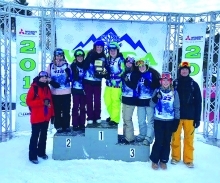 The fact that the girls won all three–Giant Slalom, Boardercross and Slalom–events helped them secure the state title in blowout fashion. This is the most dominant girls snowboard team to ever come through Middleton. Last year it came down to the last racer in the last event. This year, not at all,” coach Darrin Kolka said of the event. WESTPORT–At 9:26 a.m., Dane County Sheriff’s deputies responded to a three-vehicle crash on CTH M and Borchers Beach Rd. in the town of Westport. A 2004 Jeep Liberty was traveling eastbound on CTH M, just west of Borchers Beach Rd., when the male driver hit a patch of ice and lost control. The Jeep first hit a mini-van which ended up in the ditch, it then crossed the center line and was hit by a 2018 Toyota Camry that was traveling westbound on CTH M.
The 54-year-old male driver of the Jeep Liberty was pronounced dead at the scene. The driver of the Camry was an 85-year-old Madison man. He sustained serious injuries and was transported to a local hospital. The male driver of the mini-van had only minor injuries and was not transported. The Dane County Medical Examiner’s Office will release the name of the deceased following an autopsy and notification of family. As of noon, CTH M remains closed as deputies investigate the crash. 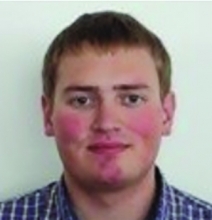 MIDDLETON–Luke Atterbury has come forward as a write-in candidate for the Town of Middleton, planning a run against incumbent, Town Chair Cynthia Richson. The 28-year-old consultant for Nordic said he will seriously begin campaigning at the beginning of March for the spring election. “I have worked for the town off and on for the last 15 years, starting as an intern election inspector,” he said of his relationship with the town. He said that the resignations and dismissals and lack of transparency are his main reasons for running for public office. “I think there is an illusion of transparency. There are more committees and processes,” he said, but doesn’t feel that more people and time spent equals transparency. 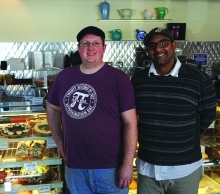 MIDDLETON–Hubbard Ave. Diner general manager and part-owner José Garcia will receive the regional Champion in Restaurant Entrepreneurship award from the Wisconsin Restaurant Association next month. Garcia along with winners from the state’s other five regions will be honored at an award gala March 12 at the Marcus Center for Performing Arts in Milwaukee. Garcia says he wasn’t expecting an award or even aware that he had been nominated but being recognized feels nice.